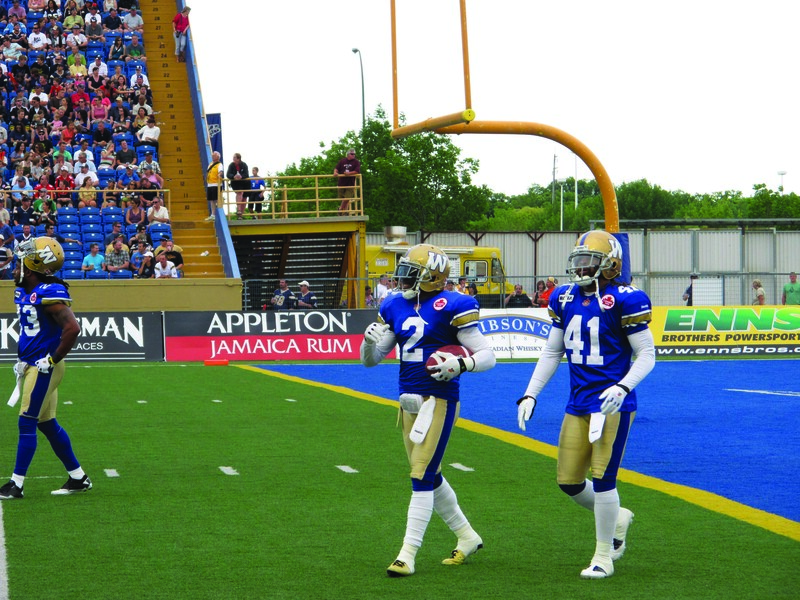 Swaggerville Inc. reached new heights during the 2011 regular season. The Winnipeg Blue Bomber defence took the CFL by storm, finishing the season near the top and leading the league in every legitimately recordable defensive statistic. Their play inspired fans as the Bombers went from worst to first in the Eastern Division, and played for the Grey Cup in Vancouver, B.C. Manitoban: Swaggerville has been around since the 2009 season. Why do you think it exploded the way it did this year? Jovon Johnson: I think its always been around, just never brought to the forefront. Our secondary has had big numbers over the past couple years, and it speaks dividends for the guys we have on our defense. I think it was not only brought to the forefront by the passing of Coach Harris, but once we sat down and found a way to attack it and take it more into the limelight, I think that was the main reason the media took it and ran with it. M: How does it feel to have defensive coordinator Tim Burke back to run the defence for another season? Clint Kent: That’s great news, man. We were kinda biting our nails a bit. He’s a great guy and we have all grown to love him and get used to him. You know, in this industry you always hope for someone to achieve their best and be successful, would have been great to see him go get head coach somewhere, but also its gonna be great to have him back and I think the defence is just gonna pick up where it left off. M: Swaggerville is gonna have a new home this season at Investors Group Field, how do you guys see that affecting the swag of the team? JJ: I think the stadium alone, once you see all the improvements, and the new facilities they have around there, that, in itself, is enough swag for us to go out on the field and continue the swag that we have. M: Are you guys against the extra road games or going back to Canad Inns Stadium if the new stadium isn’t ready on time? CK: The only thing I would say, that would come negative out of that, is not being able to be home in front of our fans. The way we finished off at Canad Inns, with the support we had with all those sell outs. It’s always awesome to play in front of that crowd, but we never have a problem playing on the road, we endure that also and we feed off the energy of going on the road. JK: It’s difficult to start the season on the road, you definitely don’t want to be on the road for nine games straight, but if you go on the road and be successful in those nine games the next nine games would be at home and major for us. M: You guys preach a pretty humble approach to playing defence, why do you guys think there is this perception that swagger is arrogance? What does it mean to really have swag? JJ: You know what. I think a lot of people, not only in America and Canada but all over the world, mistake having swagger as being arrogant or cockiness, but when you actually look up the definition of what swag means, it means having an aura about yourself and carrying yourself with confidence. That’s what we do every time we step on the field, every time we go to work, that’s just the nature of the business. If you don’t have confidence, or have swagger about yourself, how can you be successful? M: After starting the season 7-1, the team went 3-7 down the stretch. How did you guys keep faith going into the playoffs? M: Would you say 2011 was an overall successful season? JJ: It definitely was successful. When you go from worst to first in the league, with such magnitude. From 4-14, I don’t think anybody expected us to come out and be the number one ranked defence in the league, let alone make it to the Grey Cup. So it definitely was a success, and we look forward to building on that. M: The East Division has made huge headlines this offseason with the acquisition of Ricky Ray in Toronto and Henry Burris in Hamilton. How does it feel to see these teams stock up on offence to take a run at you guys? JJ: It feels good to be considered one of the best, but with the addition of Ray and Burris coming to the East it makes our job that much more difficult. At the same time we’re going to go out there and perform like we know we can, we never back down from a challenge. You always want to play the best to be the best, so were going to go out and play those guys like we played them last year. Our goal is to win, and that’s where our swag comes from. M: What would the highlight of the 2011 season be? JJ: For me, it was making it to the championship. Considering all the things we went through to get there, all the adversity. The passing of our coach who was near and dear to all of us and who had such an impact on the league, finishing the season with the 3-7, all the adversity we went through to get to where we did I think speaks dividends. AS: Definitely making it to the Grey Cup, I was able to fly my family out to see me, just to have my family there with me to experience that. Also that Eastern Final was awesome, sending out Canad Inns with a bang, fans going crazy, it being freezing with everyone still out there. That’s one of my highlights right there. M: What can fans expect from Swaggerville on the field in 2012? CK: They can definitely expect a lot of excitement, an incredible amount of swag, guys playing at a high level, jumping around, a lot of emotion and passion on the field. We’re going to try and repeat and do better than we did last year. There are plenty of things to watch for with Swaggerville prior to kickoff in July. The players plan on expanding the Swaggerville brand with a new website through which they plan on selling a new line of urban wear, which will include plenty of new Swaggerville gear for Winnipeg football fans. It’s hard not to get excited as a Bomber fan in 2012. With the state of the art new stadium, the young talent on the roster, and with a solid core returning from the Eastern Division champion team from last season, things are looking promising for the true blue.